Whether you're new to running or a seasoned athlete who has completed a dozen marathons, choosing the right pair of running shoes is essential to staying fit and avoiding injury out on the roads or on the treadmill. But not every running shoe type is right for everyone—and runners' footwear needs can also change over time. "You have to look beyond appearance, color and brand to make sure you are getting the right shoe for you," and this process can take time, says Kevin Purvis, a certified personal trainer and USAT-certified Level 1 triathlon coach who runs his own endurance-training firm, KP Training Systems. 1. Know your foot shape. The natural shape of your foot can affect how you step and run or walk (also known as your gait) as well as what part(s) of your foot will require extra cushioning to prevent injury to your feet, legs, knees, or even your back. "You need to understand your foot shape and structure, such as having a narrow heel, a wide forefoot, a low or high arch, or a decreased fat pad (the [natural] cushion on the bottom of the foot)," says Dr. Svetlana Zats, a Chicago-based podiatric foot and ankle surgeon with Ankle and Foot Centers and a recreational triathlete. The shape of your feet can also affect whether you pronate or supinate your foot (roll it inward or outward) when stepping or if your gait is neutral, Zats adds. There are different styles of running shoes for each foot type and gait, says John Honerkamp, running coach with New York Road Runners and former competitive running pro. "A neutral shoe is good for a forefront runner with a high arch who needs less support. A stability shoe is good for a runner with a flatter foot, or a heel striker. A maximalist shoe is for runners who need more support," such as heavyset runners or beginning runners who rotate their feet more than experienced ones, he explains. "A maximalist shoe, like Hokas, will provide a lot of support and cushion, while a minimalist shoe, like Vibram 5 Finger, provides very little," Purvis notes. If you're not sure what category your foot shape falls into, Purvis suggests this test. "Dampen your bare feet, step onto a surface that will show your wet footprint, squat down [with both feet], and step away and look at the print." If you see half your arch, that's considered a normal foot shape, he says, while if you see your entire foot, you have flat feet or fallen arches that will require motion control shoes. If you only see a tiny line between your forefoot and heel, you have high arches and will need a high-cushion (maximalist) shoe, Purvis adds. Your running shoes should also be a half to a full size bigger than your street shoes to accommodate foot swelling while running, Zats points out. 2. Have your running gait analyzed. Both new runners and seasoned runners who are altering their distance or training programs should have their running gait professionally analyzed before choosing shoes, experts say. You can visit a medical professional, like a doctor trained in sports medicine, a podiatrist, or a physical therapist—or you can go to a specialty running store with staff who are trained in the proper fitting of running shoes. 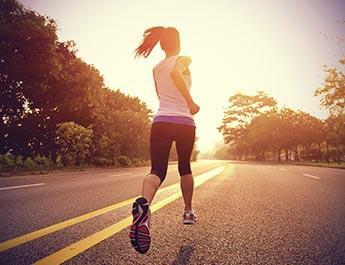 "They...not only analyze your foot and stride, but [physical therapists] can also suggest exercises for injury prevention so runners start off on the right foot (no pun intended) with their training," says Alice Holland, DPT, a running physical therapist and director of Stride Strong Physical Therapy in Portland, OR. Both medical professionals and professional running-store staff will watch you run a short distance in a pair of neutral shoes, usually on a treadmill, and will often record the run on video for further analysis before recommending a shoe type, Holland adds. "Runners can never tell what their running stride and pattern is like," she stresses, noting that even as a running professional herself, she still consults other professionals for gait analysis. 3. Find a quality running store with knowledgeable staff. When it comes to finding the right running shoes, it's best to go in person to a local specialty store that specializes in running and running shoes, rather than visiting your local mall or browsing the Internet, Honerkamp stresses. "They know feet and running shoes," he says, adding you should give yourself at least one or two hours of shopping, gait analysis, and try-on time when choosing a new pair. If you live in a rural area or other place without a local running store, Purvis suggests Road Runner Sports, a specialty online retailer that focuses on running supplies. "They have a guided purchasing process as well as liberal exchange policies to make sure you get the right shoe," he says. Quality running retailers will usually offer a trial period to get used to your shoes and will also let you return them after use if they are the wrong fit for you, experts say. Honerkamp suggests doing the first one to three runs in new shoes on a treadmill or indoor running track to see if they'll work out for the long term. "As long as the shoes are not dirty, most running shoe stores will take them back," he says. Holland takes it a step further. "I know a runner who bloodied up a pair with blisters, and still managed to exchange them," she says. "The [running] store would rather keep a customer for life and sacrifice a pair than have a bad reputation for ill-fitting shoes." Your shoe needs may change over time as you develop as a runner. You may need to switch from general running shoes to trail-running shoes if you begin training regularly on rough dirt or gravel trails instead of on pavement or a treadmill, or you may require less foot support as your running gait improves. Or you may develop aches and pains as you age that will require special attention. If you're a naturally heavy person or have recently gained weight due to inactivity or increased muscle mass, you'll need more cushioned shoes, says Andrew McMarlin, DO, a Mount Pleasant, SC-based physician and former Olympic rower who is board-certified in sports medicine and family practice. "Ground reaction forces increase as a runner's weight increases," McMarlin explains. "Heavier runners need to be aware of this additional demand on their joints and choose properly supportive shoes." Runners with knee osteoarthritis should also consult with a physician or physical therapist about which shoes or shoe inserts can help reduce stress on their knees, he adds. And if you're ever planning to switch from traditional shoes to minimalist "barefoot" shoes, you should phase them in to prevent injury to your Achilles tendons and insteps. "I recommend walking in them for 20 to 30 minutes [at a time] for a few weeks before running in them," McMarlin stresses. A quality pair of running shoes can cost anywhere from $80 to $250, depending on type and brand, our experts say. "While that might seem pricey to the first-time buyer, remember your shoes are the only thing between your foot and the ground," Purvis cautions. "Saving a few dollars short-term could lead to much higher costs in the long run."